For three hundred years the nine of diamonds in an ordinary pack of playing cards has been known to card players as "The Curse of Scotland". Why? The most likely answer is a reminder of one of the darker figures in Scotland's history. Meanwhile the wide range of other explanations that have been offered gives a fascinating insight into the way myths can grow, evolve, interact and fragment. The nine of diamonds was first called "The Curse of Scotland" in print in 1710. "The Curse" almost certainly refers to Sir John Dalrymple, 1st Earl of Stair, who had died three years earlier. 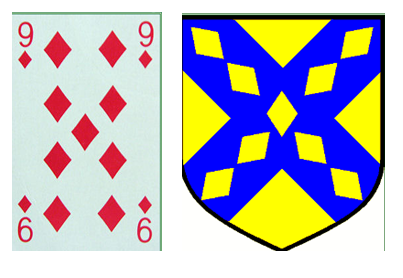 The reason for the connection with this particular card is pretty clear from a look at the Dalrymple family crest (shown above), and its similarity with the pattern on a nine of diamonds. Dalrymple had been a highly effective politician, but was also utterly ruthless in his pursuit of causes that were deeply unpopular with many Scots. He had been highly influential in persuading the Scots to accept William and Mary in place of James VII in 1688, which led to his deep hatred by Scottish Jacobites. And as Secretary of State for Scotland it was Dalrymple who ordered the Glencoe Massacre in the early morning of 13 February 1692. The public outcry that followed led to Dalrymple's resignation from Government, but he was once again in a position of power in Scotland in the early 1700s and played a significant part in pushing through the Act of Union with England in 1707, though it was not finally approved until after his death. As a result a large number of anti-Union Scots also came to dislike his memory. So whether the phrase "The Curse of Scotland" was originally coined by those who disliked Dalrymple because they were Jacobites, or anti-Unionists, or simply because of his role in the Glencoe Massacre, it found a ready audience across the country and rapidly caught on. Other versions of the origin of the expression are less persuasive. One story goes that the order to give no quarter to the Jacobites at the Battle of Culloden was written by the Government commander, the Duke of Cumberland, on a nine of diamonds. It is hard to imagine the Duke of Cumberland ruining a pack of cards for the want of a notepad: and as it took place in 1746, the battle post-dated the appearance of the phrase by 36 years. A similar problem accompanies the idea that the link dates back to the eve of the Battle of Culloden, when two of Bonnie Prince Charlie's officers were playing cards until they found the nine of diamonds to be missing, and commented that it must have been stolen by the Duke of Cumberland. The observant will also note that on the eve of the battle the Jacobite army was actually making a pointless forced march to Nairn and back. An alternative theory revolves around the card game called Pope Joan, in which the nine of diamonds is called "The Pope", not the most popular person in Scotland in the years after the Reformation of 1560. A variant on this theory is that the game was introduced to Scotland by the Catholic Marie de Guise, the mother of Mary, Queen of Scots. Further historical possibilities have been suggested. One early tourist through Scotland, Captain Francis Grose, wrote in 1786 that the nine of diamonds had acquired its reputation because it was like the crest of the Campbell Dukes of Argyll. There is no obvious similarity and this version of the story seems easiest to explain in terms of a misunderstanding: that Grose was told that the link resulted from the crest of the man behind the Glencoe Massacre, and combined it with the popular myth (then as now) that the massacre was the work of Clan Campbell, rather than a calculated act by the Government of the day. Equally unlikely is the story that the name comes from the presence of diamonds on the family crest of Colonel Packer, who led the Cromwellian army that defeated the Scots at the Battle of Dunbar in 1650. And while we've already seen that the link cannot have arisen because of anything written on a nine of diamonds before the Battle of Culloden, the idea that it comes from the orders for the Glencoe Massacre being written on a nine of diamonds is equally fanciful. The orders for the massacre still exist, and would certainly not have fitted on a playing card. It is equally easy to dismiss the idea that the link comes from James IV writing his battle plans for the catastrophic Battle of Flodden in 1513 on a nine of diamonds: given a full pack and an urgent need to make notes, who would use a nine instead of the greater space offered by an ace or a two? Even more unlikely theories exist. These include the idea that the link results from every ninth King of Scotland having been a tyrant and a curse to the country. This fails, amongst other reasons, on the grounds of historical inaccuracy: the proportion of bad Scottish kings was far higher than one in nine! It has also been suggested that the link stems from the theft of nine diamonds from the Crown of Scotland by a George Campbell during the reign of Mary, Queen of Scots in the 1560s, and the tax the monarchy is supposed to have enacted to pay for their replacement. No, when you browse through all the possibilities, only one really seems in any way compelling. The irony is that if Sir John Dalrymple, 1st Earl of Stair, could read this page, he'd probably be quietly satisfied that he is remembered in the name given to a playing card, even a name as negative as "The Curse of Scotland".